That is the premise of the book, “Dear Me” – Edited by Joseph Galliano. What would you tell your sixteen year old self anyway? What would you stop him or her from doing, which you know will be futile anyway, because he or she will not listen to the older you? The book is of famous people – of celebrities writing to their younger self, dispensing advice, providing nuggets of wisdom and trying to go back in time and perhaps contemplate on how life was. The book is a revelation of sorts and at other times, I was tempted enough to pick up the notepad and write a letter to my sixteen-year-old self. 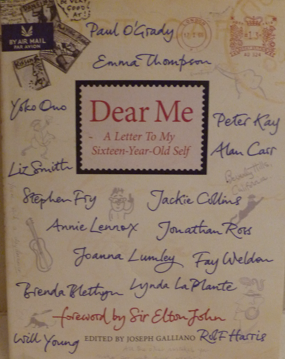 There were letters that stood out – the ones by Elton John, Emma Thompson, James Woods, Jodi Picoult, and so many more. There are 75 letters in all, written by celebrities from various fields – from actors to comedians to novelists, they all are written depicting youth and what is called growing-up. These letters touch on issues that are still prevalent – from gay rights to racism to being felt left out – the letters provide a sense of warmth and at the same time you empathize with at least a few of them, because you have gone through the same. “Dear Me” is a bitter-sweet journey through life, sometimes scarily a reflection of your own. It is a book of letters, of contemplation, of thoughts and ideas. Joseph Galliano has done a wonderful job of editing this book and somehow compels you to write a letter to your sixteen-year-old self, sharing your fears and maybe consoling him or her – to let them know that it will all be alright, after all. This entry was posted in Books, Letters, Review, Simon & Schuster and tagged Celebrities, Dear Me, growing up, Joseph Galliano, Letters, life, living, Loving on August 12, 2014 by thehungryreader. This has to be one of the best non-fiction books I have read this year. Or rather one of the best books of letters which I have read in a very long time. 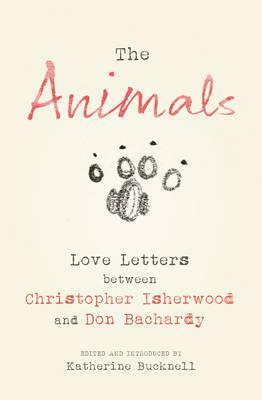 “The Animals” – Love Letters between Christopher Isherwood and his long-standing lover Don Bachardy is a treat for anyone who loves being in love and reading about unconventional (so to say) love. Christopher Isherwood was an acclaimed writer when he met Don Bachardy on a Santa Monica beach in 1952 and their love affair – or rather romance – or just love lasted until Chris’s death in 1986. The book is about letters – they wrote to each other and the names they gave each other. Chris was Dobbins – the work horse while Don was Kitty – the young cat. The letters in themselves are sometimes calm and sometimes tumultuous and full of despair, jealousy and anger. It is the usual letters that lovers write and also somewhere down the line; they are unusual, given the nature of their relationship and the but obvious age-gap. The letters make you ponder about the times they lived in, how they loved and how they did not fear to live as a couple – given the social thinking in the 50s. They wavered and fought like any other couple. They had their differences and yet somehow in the letters, you see the great love between them. Something that we all want to achieve. It did take me some time to get through the letters, however the experience has been extremely rewarding. The idea of getting to know Isherwood more and his relationships was intriguing for me and I am only glad that I read this book. I will recommend it only to people who are interested in a book of this nature. Of a different love in a different time and age. This entry was posted in Books, Chatto and Windus, Homosexuality, Letters, Non Fiction, Random House UK, Review and tagged Chatto and Windus, Christopher Isherwood, Dobbins, Don Bachardy, homosexuality, Kitty, Letters, Love, Non-fiction, Random House UK, The Animals on December 6, 2013 by thehungryreader.